The Savannah smocked collar was inspired by the colonial practice of hand smocking to achieve an adjustable but beautiful garment for growing children. While smocking has been popular for hundreds of years as a means of gathering fabric in areas such as necklines, cuffs, and waists where elasticity is desirable, today, smocking is used mainly for embellishment, and beautiful, heirloom-quality designs can be quickly and evenly achieved with machine embroidery.The Savannah collar is accented by a thin edge of flat lace, although narrow rick rack trim or entredeux with ribbon also works well. Directions are included for hemming your collar with flat lace. If you want to use rick rack or entredeux and ribbon, you will need to add these after you have machine pleated your collar. Either embellishment can be added to hand pleated fabric.This collar comes with four fall smocking designs: Apples, Leaves, Pumpkins, and Turkeys. as well as 18” dolls such as American Girl®. 5 x 7 hoop and larger required; each design measures between 4.67" and 5.30" with the smallest design measuring 4.67" x 5.16" and the largest measuring 4.88" x 5.30." The Savannah collar can be machine pleated with an English smocking pleater or pleated by hand, according to the directions included in the instruction sheet. I do not have a pleater and the designer suggested that the pattern would look equally nice on an unsmocked fabric. I went ahead with this and was very happy with the outcome. 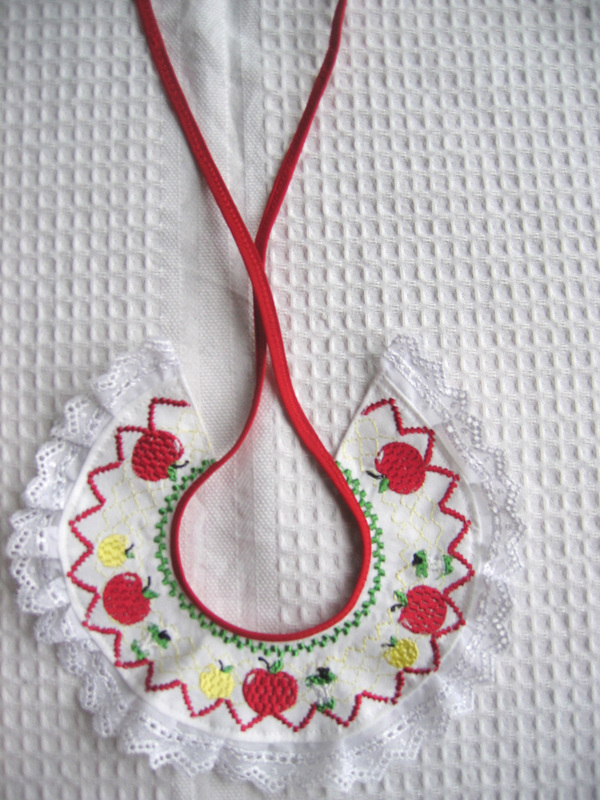 I did the apple version and added lace to the bottom and red bias binding to the neck. I left it as a stand alone collar so it could be added to a number of outfits. 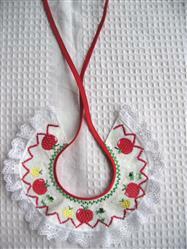 The embroidery was well digitised and the pattern is very attractive.